The Natural and Healthy Food Choice To Make Your cats happy and healthy every day! Gourmet Delight and our line of cat food brands adhere strictly to the Australian Standard 9(AS5812- 2011) regarding the manufacturing and marketing of cat or pet food and labels. Cat owners, living in the information age, are more savvy as to what their cat’s are eating, they are asking questions like how was it made and what is in my natural cat food. Gourmet Delight seeks to provide the best cat food brands for all the needs and preferences of our clients and their fussy feline friends, and with PFIAA certification you can rest assured that the food you are feeding your cat is appropriate. Why gourmet delight cat food brands should be given to your feline babies? 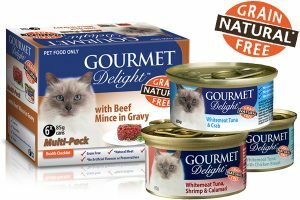 Gourmet Delight ensures that your kitty is given all natural and grain free real meat and fish and chicken, as nature intended. We pride ourselves in creating, great tasting, all natural recipes, and most importantly ensure that our foods are grain free making as the leading among cat food brands Australia. Cat owners can now rest assured that there are no cheap and nasty fillers that are often found in commercial cat foods. Gourmet Delight has stringent production and quality standards and multiple quality checks prior to the product hitting the shelves. Gourmet Delight cat food brand is affordable and reasonably priced, we believe in great value all natural real food for real cats, and cat owners that want to get real about the food they are feeding their cats, need look no further than Gourmet Delight. Furthermore, our products uphold high standards of palatability for the feline members of your household, th real natural meat and fish and chicken that we use, contributes to the taste, we also supply various textures which can be important for fussy cats. Gourmet Delight is high quality Grain Free cat food that utilises all natural and real meat and fish and chicken, we try and mimic the diet of cats in the wild, to suit the physiology of the feline species, so that cat owners can feed their cats as nature intended. GOURMET DELIGHT OFFERS THE BEST CAT FOOD BRANDS IN THE MARKET! Cat owners can rest assured that we keep it simple at Gourmet Delight, we supply premium, high quality, protein and nutrients in a grain free, canned cat food, that is made to the highest quality standards. Gourmet Delight premium cat cuisine, is proud to be natural as nature intended. GRAIN FREE with REAL NATURAL meat & fish and containing no artificial flavours and preservatives its a healthy gourmet meal. Available in a range of delectable fish & meat flavours there is something to suit the fussiest eaters. Delight your loved one with gourmet natural cat cuisine. ©2019 Gourmet Delight. All rights reserved.